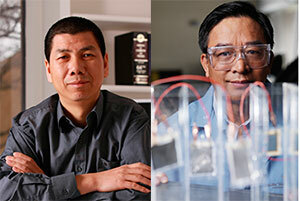 Jun Liu (left) and Jason Zhang (right) were both recognized by Thomson Reuters as highly cited researchers in their respective fields. Other researchers want to know what Jun Liu and Ji-Guang (Jason) Zhang have to say. When it comes to peers citing their work, these two PNNL scientists are among the top one percent in the world according to Thomson Reuters. The magazine identifies top researchers from 21 different fields, such as materials science or engineering. Liu focuses his work on materials synthesis and application, particularly for energy applications, such as batteries. A laboratory fellow, he was recognized by Thomson Reuters for his work in both materials science and chemistry. With more than 350 peer-reviewed publications, an H-factor of 85, and more than 55 U.S. patents, Liu has a lot of material to cite. He has served as a division director since March 2013. He is also a Fellow for the Materials Research Society (MRS) and a Fellow for the American Association for Advancement of Sciences (AAAS). Zhang focuses his work on energy storage—specifically on batteries that are smaller, more efficient, and less expensive. Also a laboratory fellow, he was recognized by Thomson Reuters for his work in engineering. He holds 17 patents (with another 19 patents pending) and has more than 200 papers published in professional journals. Zhang has 24 years of experience in the development of energy storage devices, including lithium-ion batteries; thin-film, solid-state batteries; Li-S batteries; lithium-air batteries; and electrochromic devices. Four other PNNL researchers were also recognized. For more information, read the PNNL News Release.